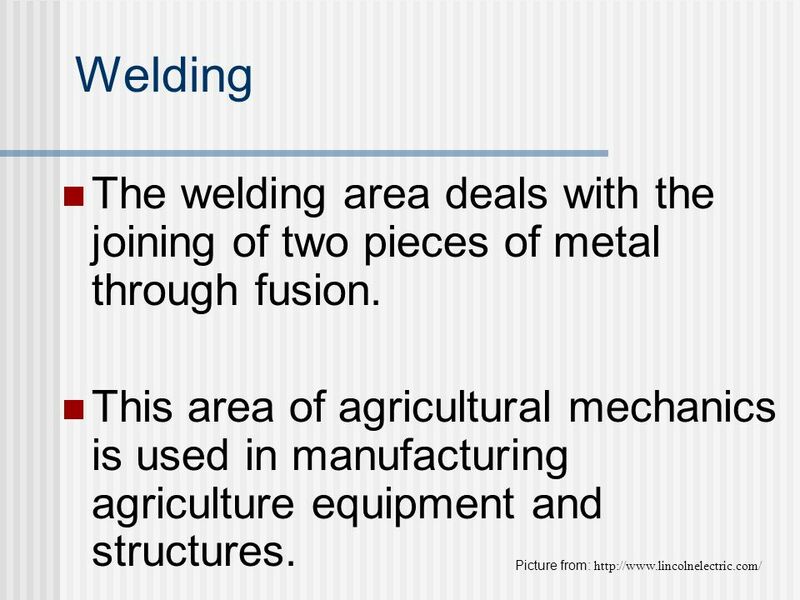 Identify the different areas of agricultural mechanics. Identify careers available in agricultural mechanics. 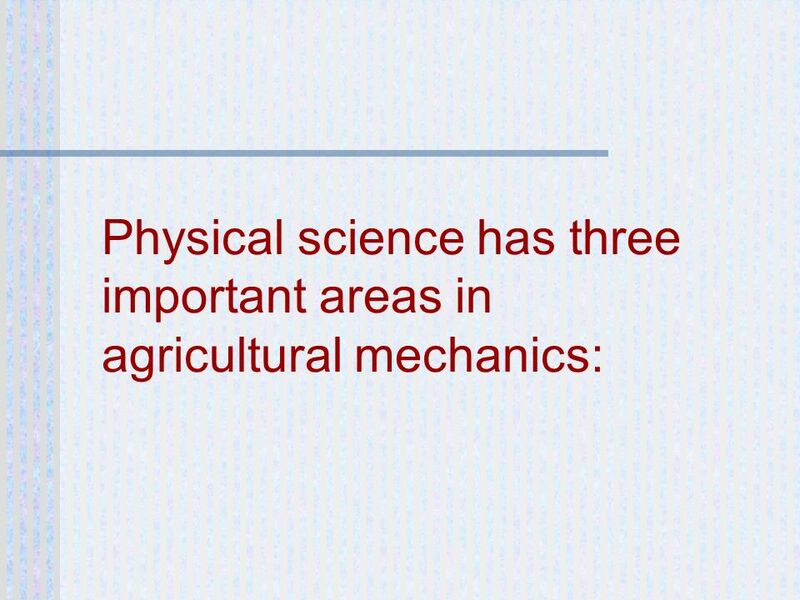 Identify the important physical science areas in agricultural mechanics. 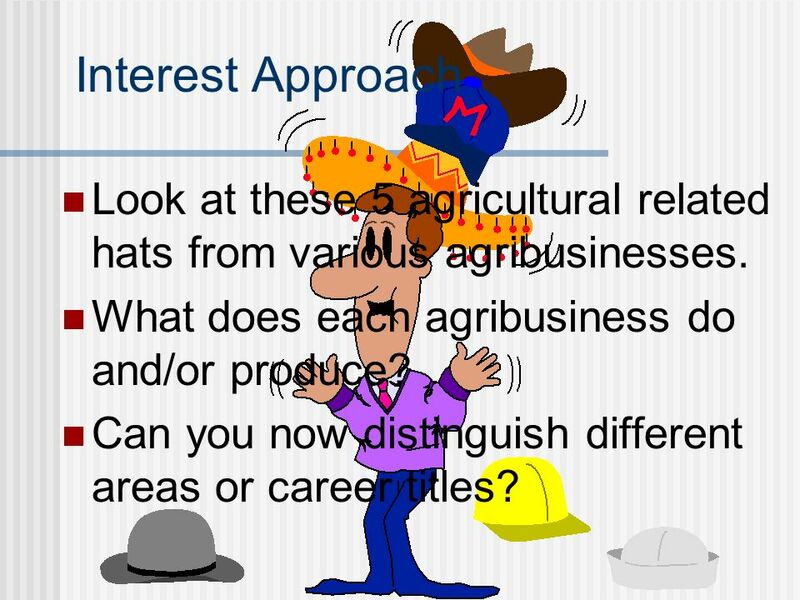 4 Interest Approach Look at these 5 agricultural related hats from various agribusinesses. 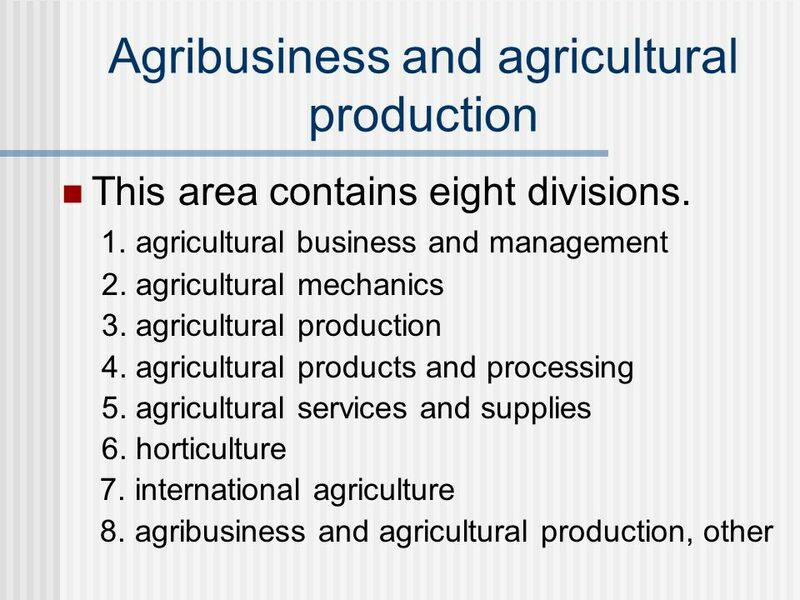 What does each agribusiness do and/or produce? Can you now distinguish different areas or career titles? 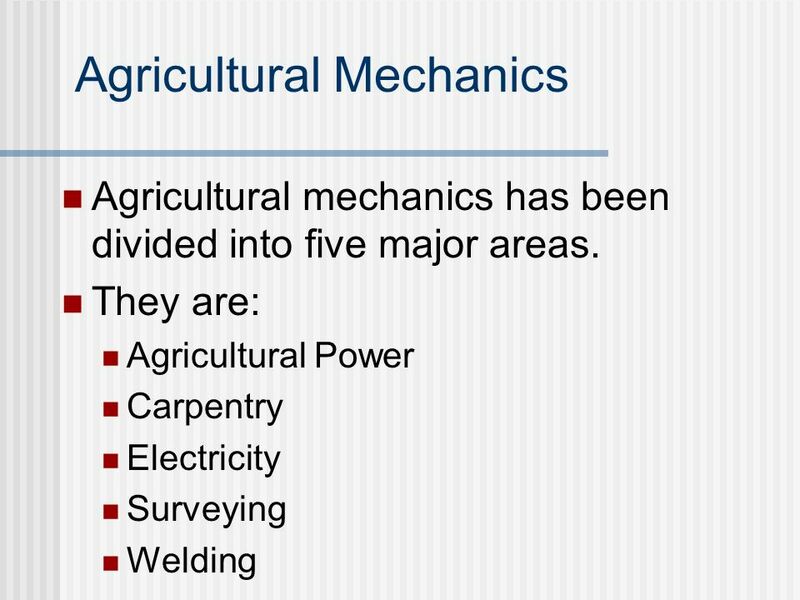 5 What are the different areas of agricultural mechanics? 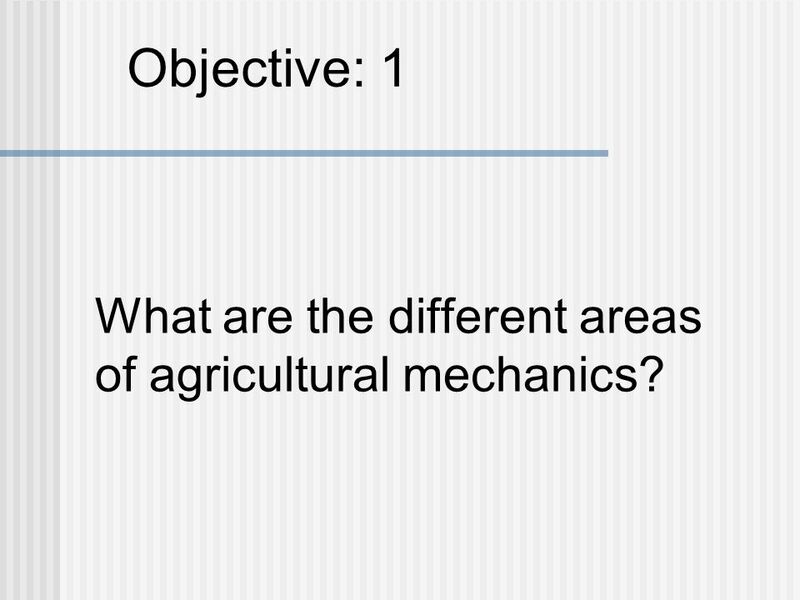 Objective: 1 What are the different areas of agricultural mechanics? Agriculture continues to be one of the most sophisticated and mechanized industries in the world. 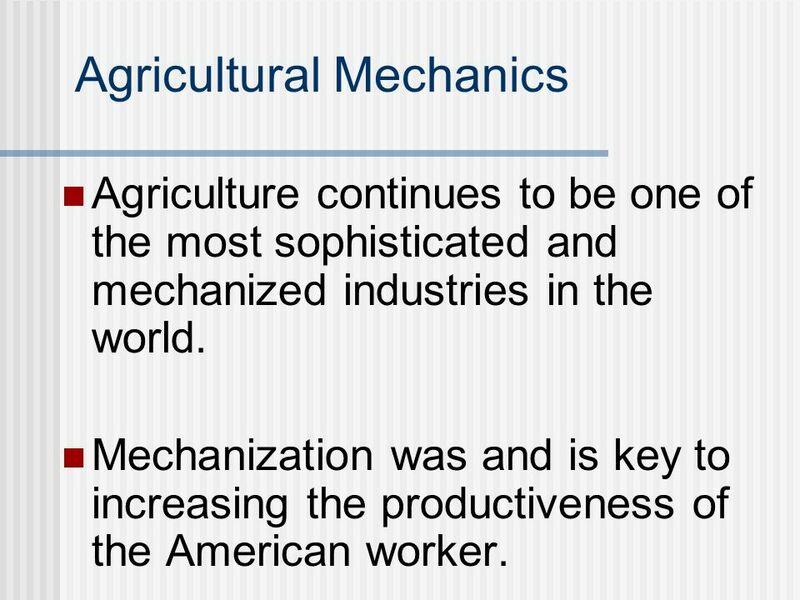 Mechanization was and is key to increasing the productiveness of the American worker. 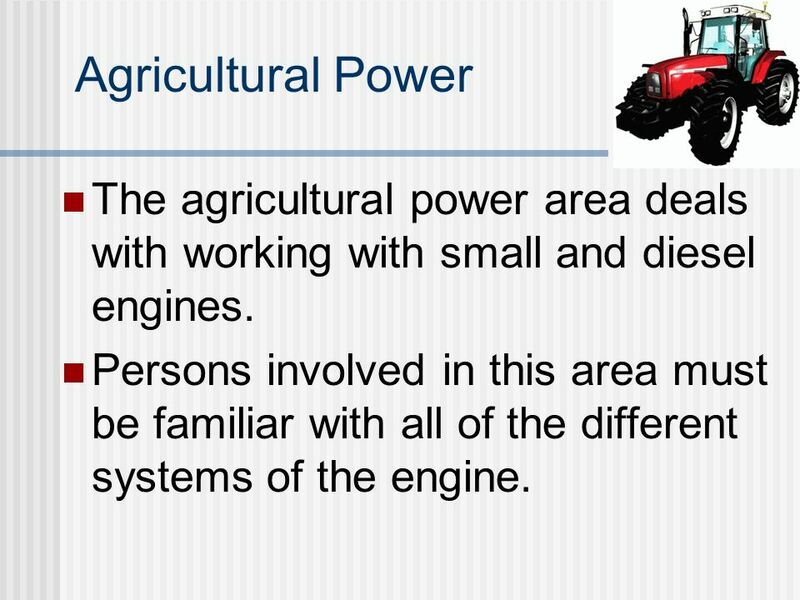 8 Agricultural Power The agricultural power area deals with working with small and diesel engines. Persons involved in this area must be familiar with all of the different systems of the engine. 9 Carpentry The carpentry area deals with woodworking for a variety of purposes in agriculture, including the building of agricultural structures. 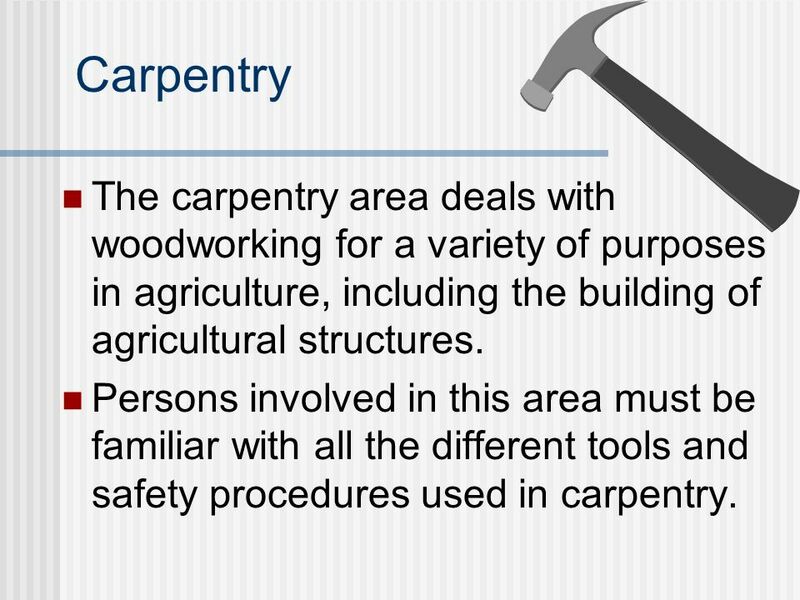 Persons involved in this area must be familiar with all the different tools and safety procedures used in carpentry. 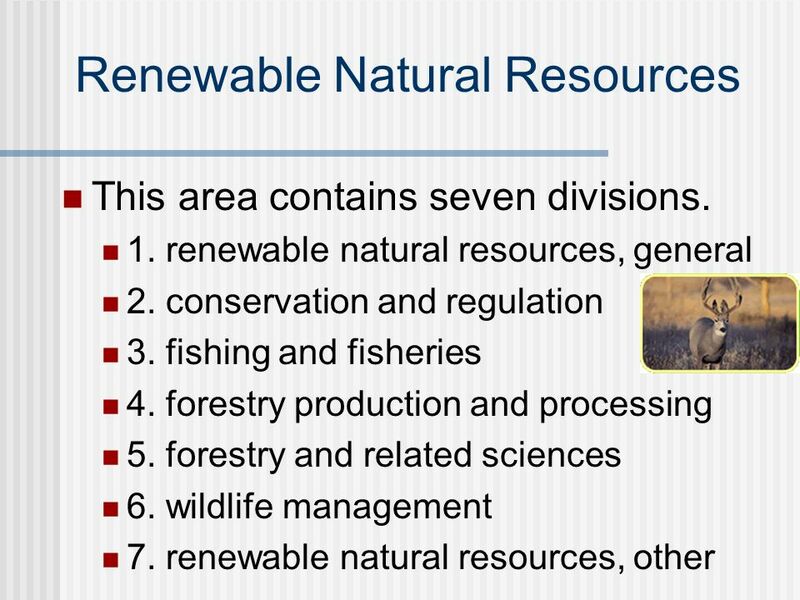 10 Electricity The electricity area deals with the uses of electric power in agriculture. 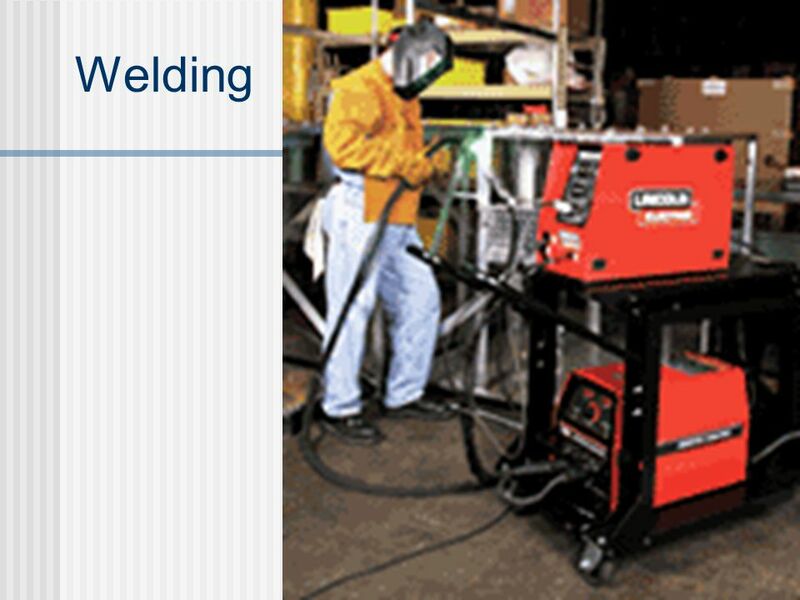 This includes dealing with electric motors, lights, and other electric controls. 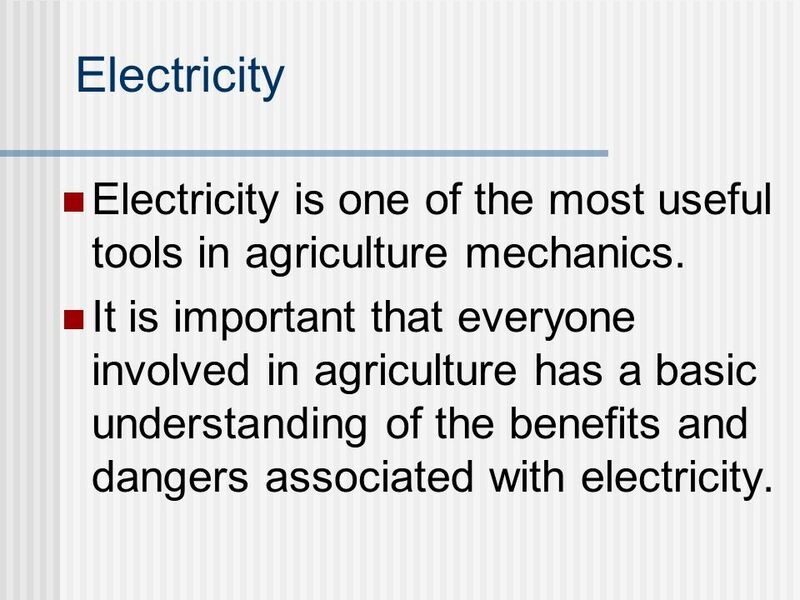 11 Electricity Electricity is one of the most useful tools in agriculture mechanics. 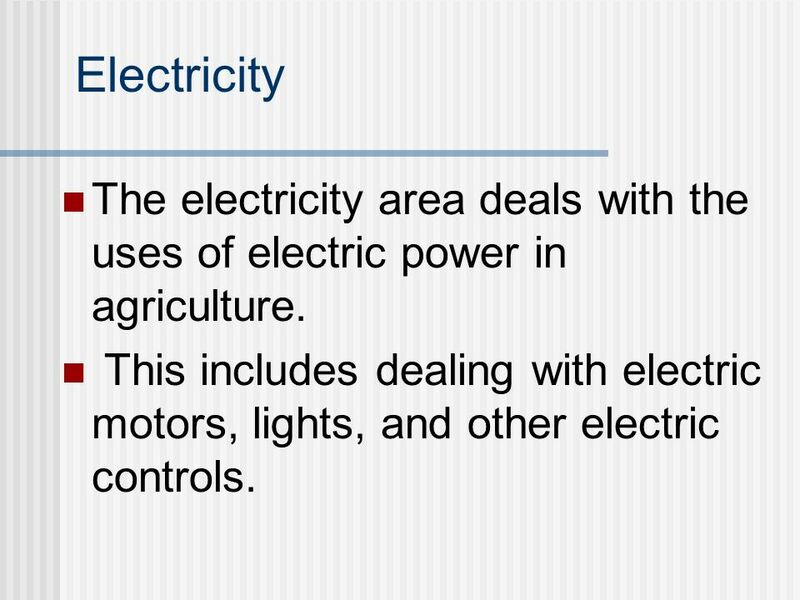 It is important that everyone involved in agriculture has a basic understanding of the benefits and dangers associated with electricity. 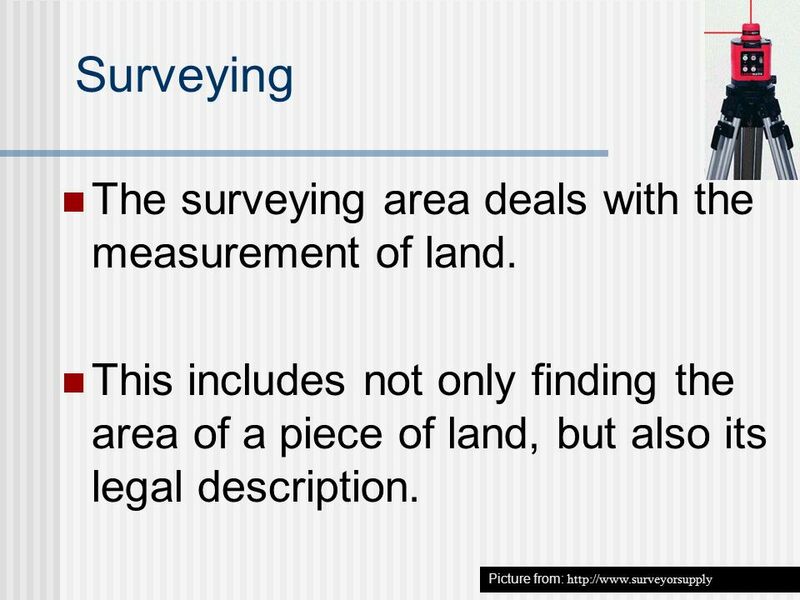 12 Surveying The surveying area deals with the measurement of land. 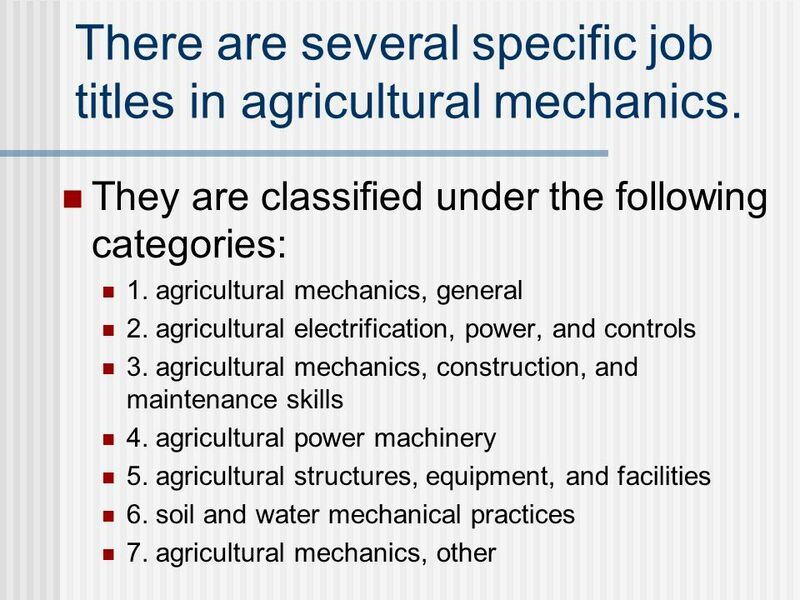 16 What careers are available in agricultural mechanics? Objective: 2 What careers are available in agricultural mechanics? 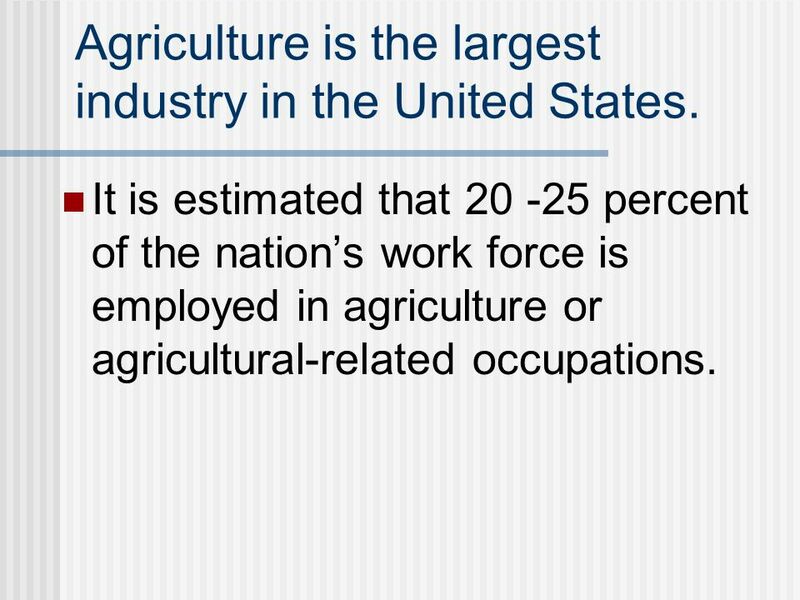 17 Agriculture is the largest industry in the United States. It is estimated that percent of the nation’s work force is employed in agriculture or agricultural-related occupations. 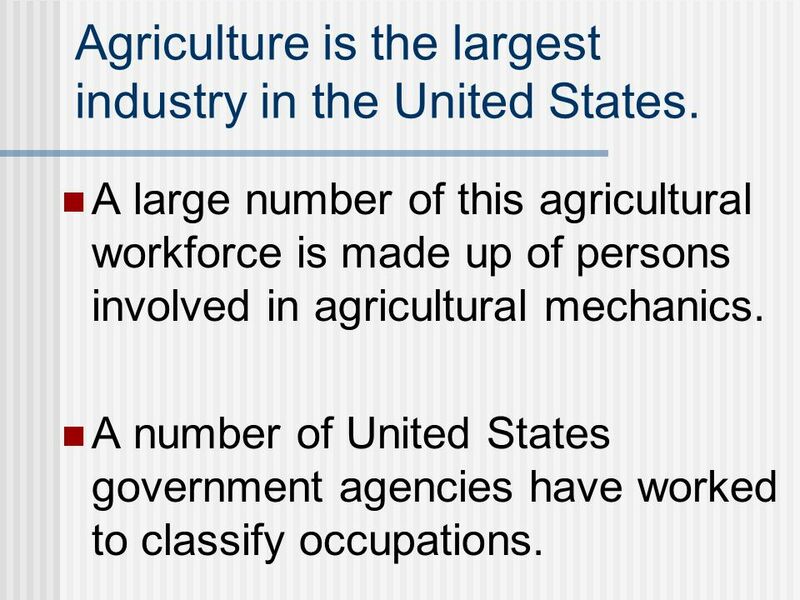 18 Agriculture is the largest industry in the United States. A large number of this agricultural workforce is made up of persons involved in agricultural mechanics. 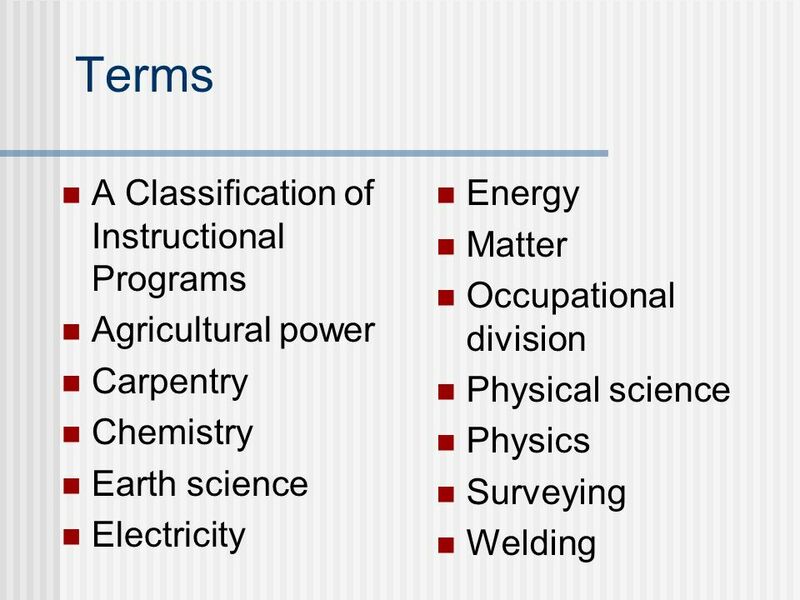 A number of United States government agencies have worked to classify occupations. 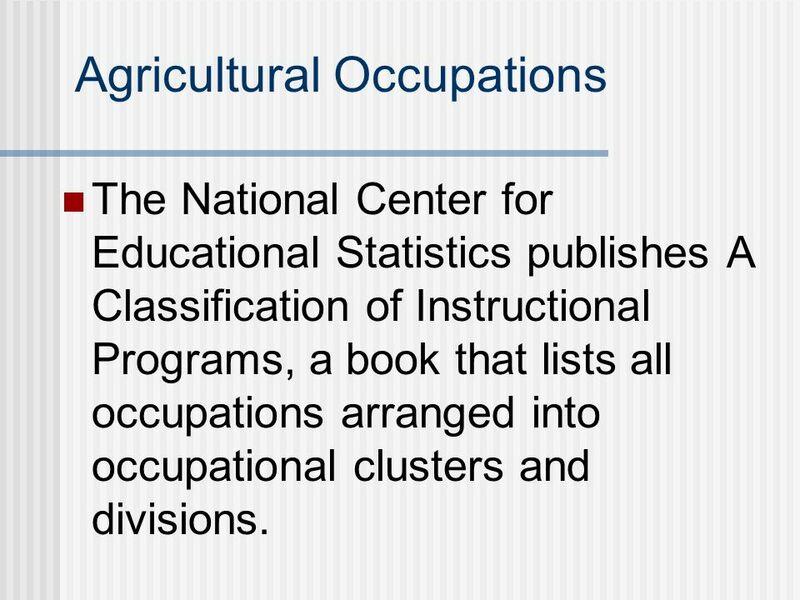 The National Center for Educational Statistics publishes A Classification of Instructional Programs, a book that lists all occupations arranged into occupational clusters and divisions. An occupational division is a group of occupations or jobs within a cluster that requires similar skills. 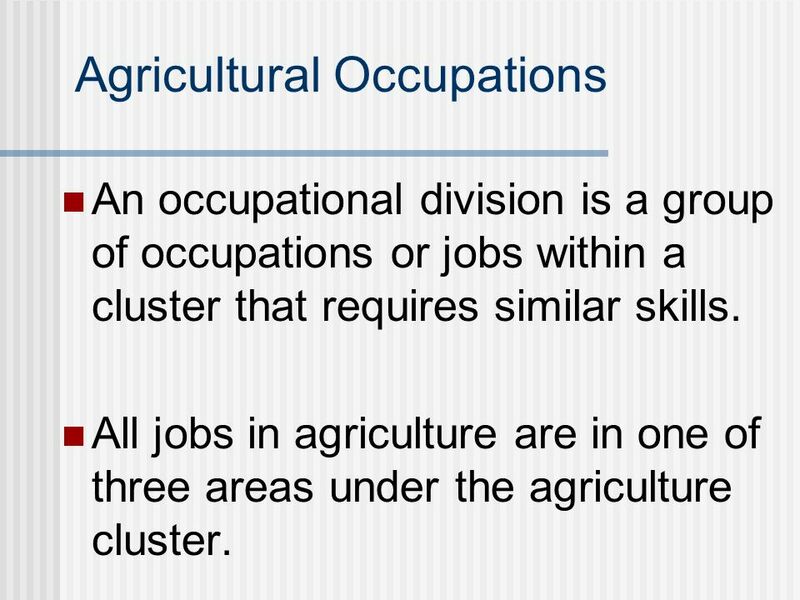 All jobs in agriculture are in one of three areas under the agriculture cluster. 24 There are several specific job titles in agricultural mechanics. 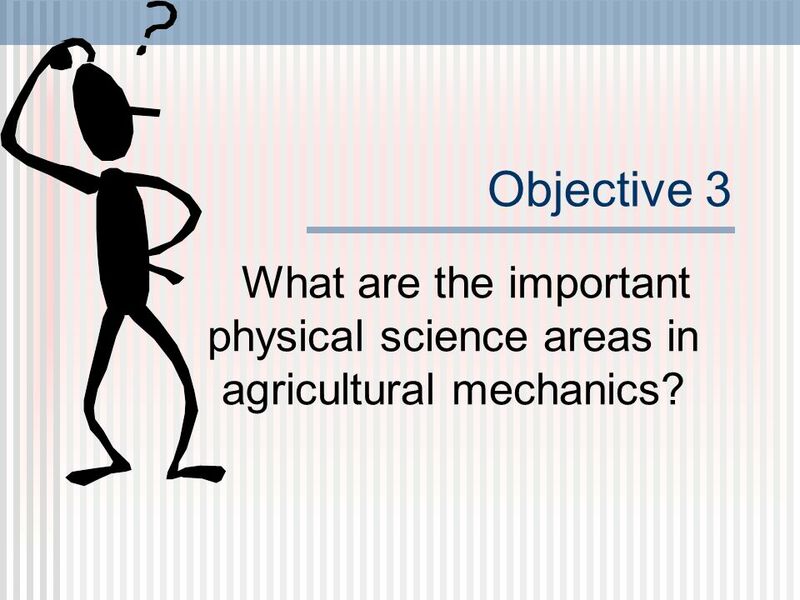 25 Objective 3 What are the important physical science areas in agricultural mechanics? 26 Physical Science The agricultural industry is becoming increasingly technology based. 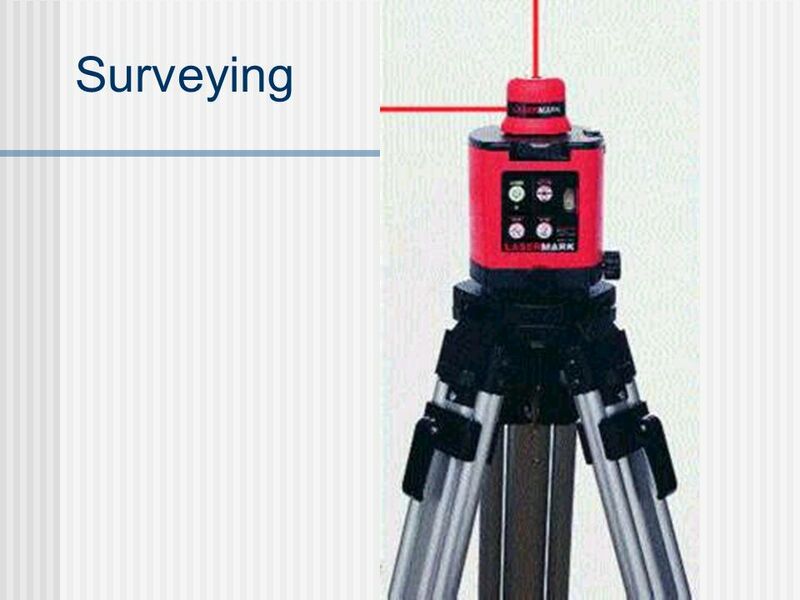 Agricultural mechanics’ foundation is the relationship of the laws of science and mathematics which explains why what is done in this area is possible. 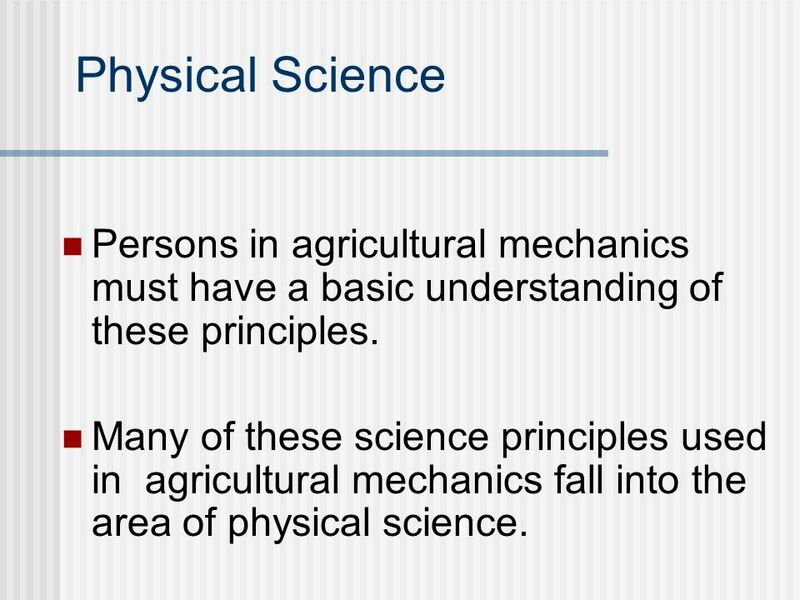 27 Physical Science Persons in agricultural mechanics must have a basic understanding of these principles. 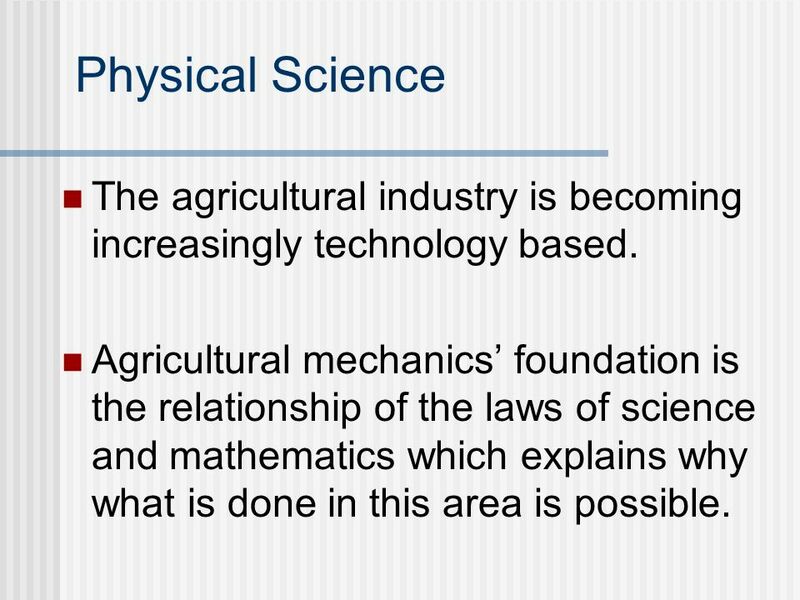 Many of these science principles used in agricultural mechanics fall into the area of physical science. 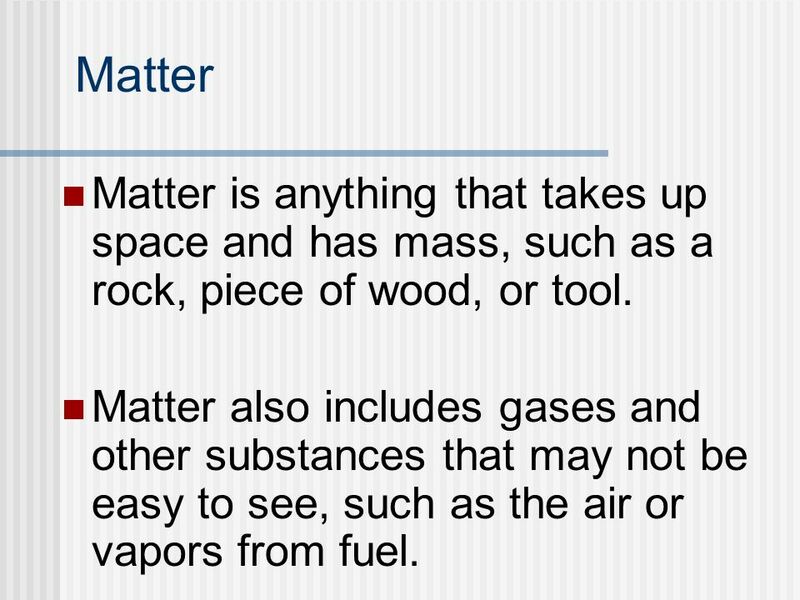 29 Matter Matter is anything that takes up space and has mass, such as a rock, piece of wood, or tool. Matter also includes gases and other substances that may not be easy to see, such as the air or vapors from fuel. 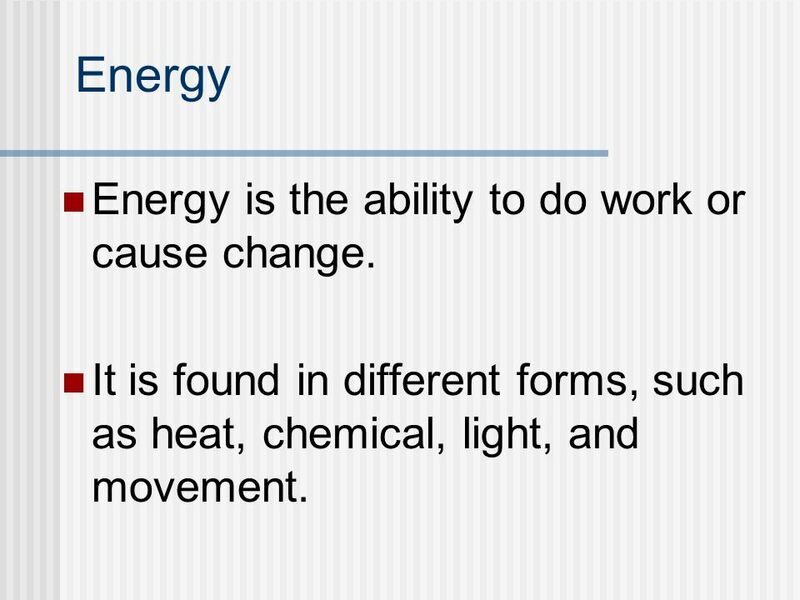 30 Energy Energy is the ability to do work or cause change. It is found in different forms, such as heat, chemical, light, and movement. 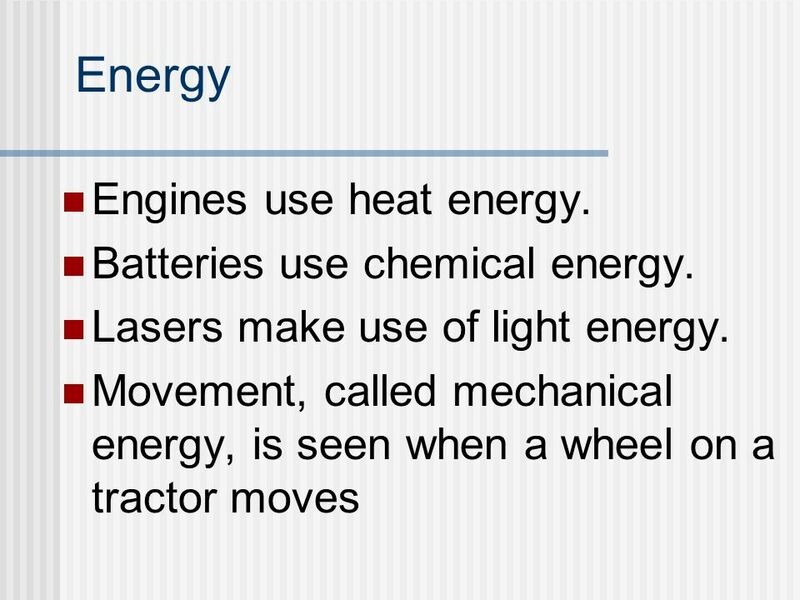 31 Energy Engines use heat energy. Batteries use chemical energy. 33 1. 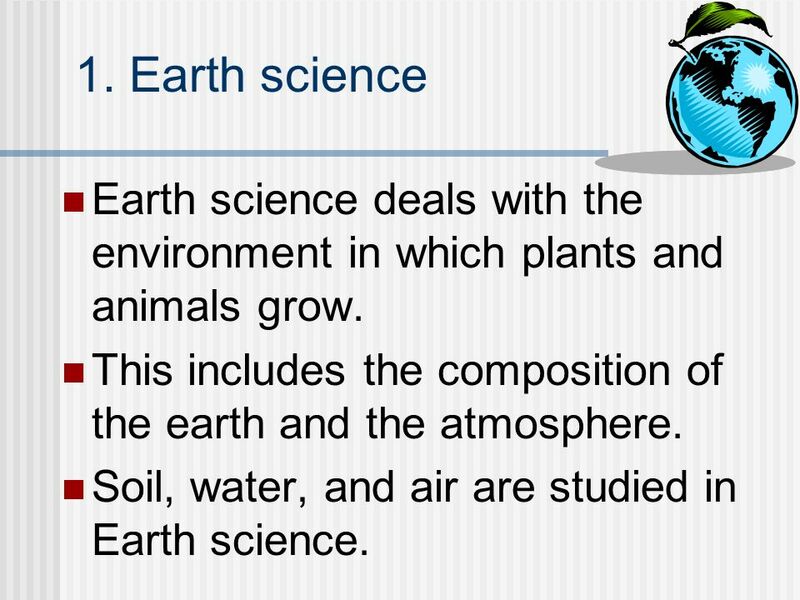 Earth science Earth science deals with the environment in which plants and animals grow. This includes the composition of the earth and the atmosphere. Soil, water, and air are studied in Earth science. 34 2. 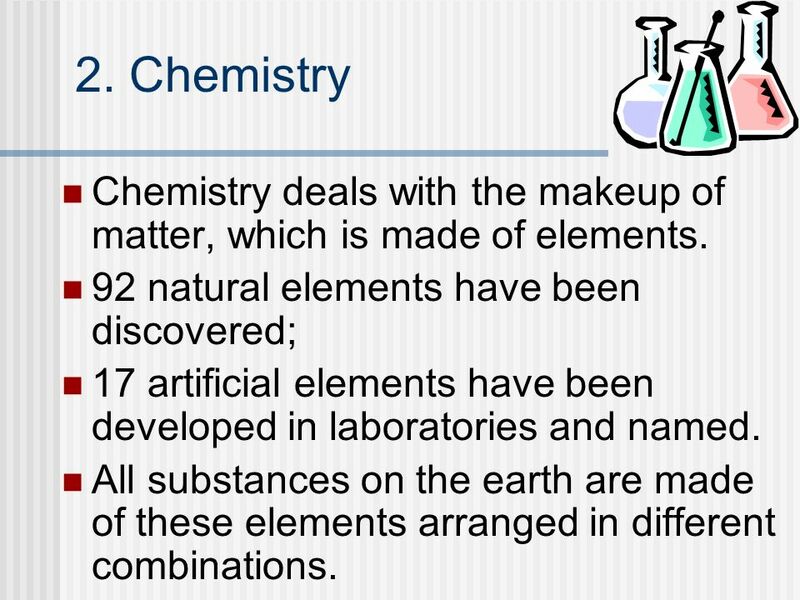 Chemistry Chemistry deals with the makeup of matter, which is made of elements. 92 natural elements have been discovered; 17 artificial elements have been developed in laboratories and named. All substances on the earth are made of these elements arranged in different combinations. 35 3. 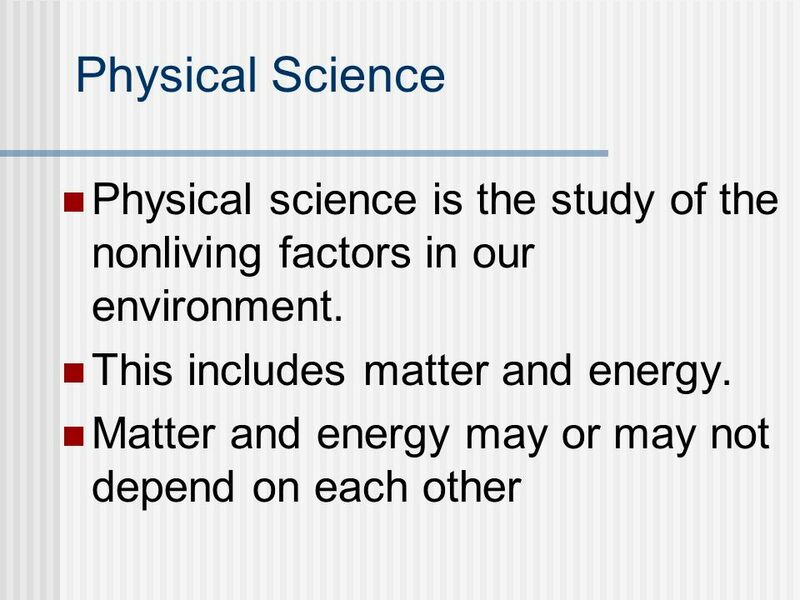 Physics Physics deals with matter and energy and how the two relate. 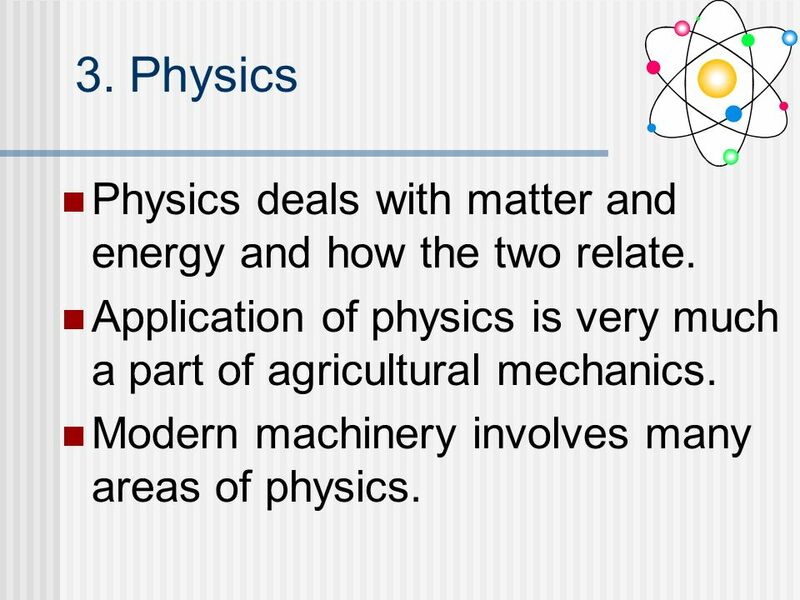 Application of physics is very much a part of agricultural mechanics. Modern machinery involves many areas of physics. 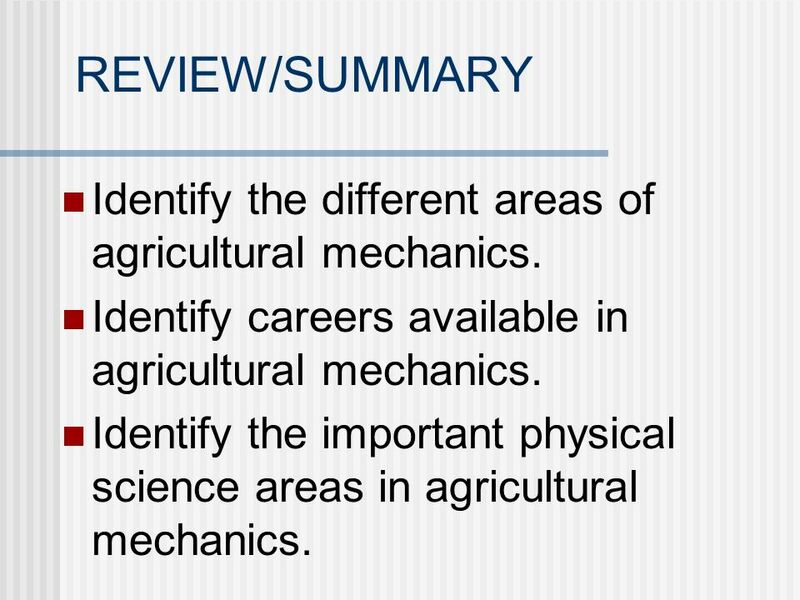 36 REVIEW/SUMMARY Identify the different areas of agricultural mechanics. Identify careers available in agricultural mechanics. 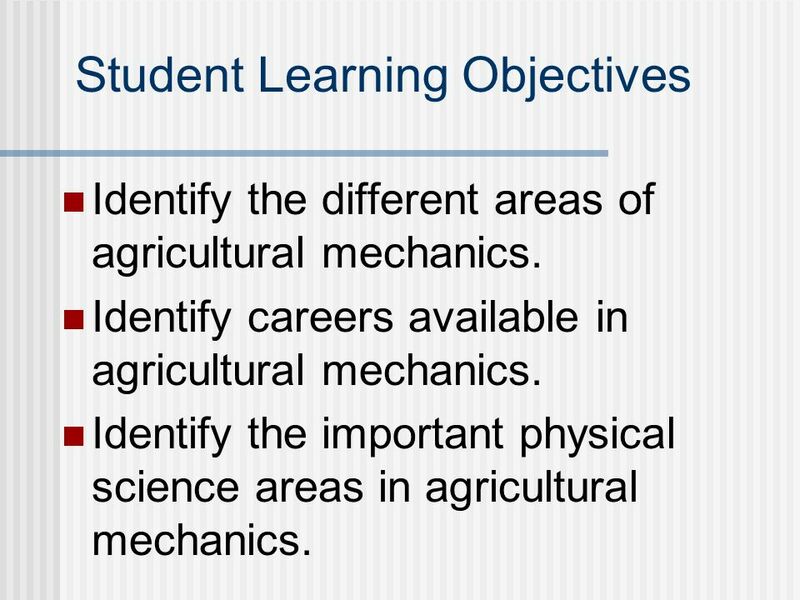 Identify the important physical science areas in agricultural mechanics. 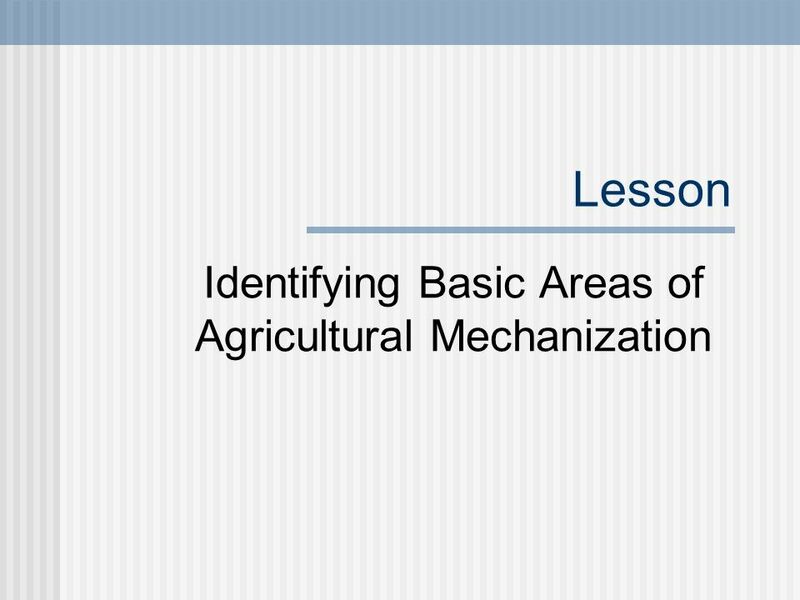 Download ppt "Identifying Basic Areas of Agricultural Mechanization"
Physical Science and Technology. What is Science? Knowledge we gain from studying or world Physical –How things work Biological –Life. Lesson Exploring Careers in Agricultural Mechanics and Technology Systems. Engineering Disciplines © 2012 Project Lead The Way, Inc.Introduction to Engineering Design. GROWING LEADERS Opportunity. Engagement. Achievement. Susan Pheasant, Ph.D Agriculture Business & Technology Institute May 2014 Director. 6.01 Careers in Agricultural Engineering Obj. 6.01: Remember careers in agricultural engineering Photos courtesy of Google Images. Business Technology Education Cluster: Business Management & Administration Program of Study: Administrative & Information Support. Introduction to Engineering. Engineering (defined) 1.The art of applying scientific and mathematical principles, experience, judgment, and common sense. 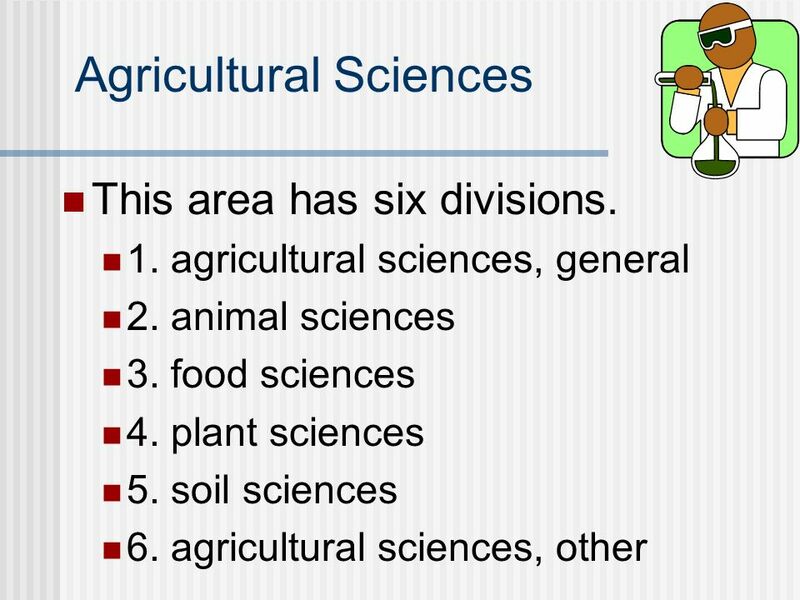 College of Agricultural Sciences Press Ctrl + L for full-screen mode; then proceed to next slide to begin presentation. Luke Gibbs. Job Description  Agricultural engineers use their knowledge to solve the problems of farmers and the agricultural industry. They work to. Agriculture Careers Bellwork: What future career do you see yourself in? Bureau of Labor Statistics Green Jobs Initiative Dixie Sommers Bureau of Labor Statistics Association of Public Data Users 2010 Annual Conference September. E&NR I Employability Skills 4.0. CAREER AREAS AND OCCUPATIONS. © Thomson/South-WesternSlideCHAPTER 141 CAREER INFORMATION The World of Work Exploring Occupations Chapter 14. KDM Science Fair!. Elementary Science Fair Anyone in 4 th and 5 th grade can participate! KDM Fair: January 24, 2013. Presented by: Cory Grimes. Work Interests People in this group like jobs where they discover, collect, and study facts about the natural world. They use.